The opening par 4 on the Bluffs Ho Tram Strip is pretty straightforward as long as you keep left of the green you should avoid the trouble. The first of the par 3’s which follows is also one of the most difficult with OB along the left side, water to the right and bunkers in front and behind – the only consolation is the green which if you manage to make it is pretty flat. The next par 3, although shorter, is equally daunting with the prevailing wind making club selection difficult with two deep bunkers protecting the front of the green – par here is a good score! 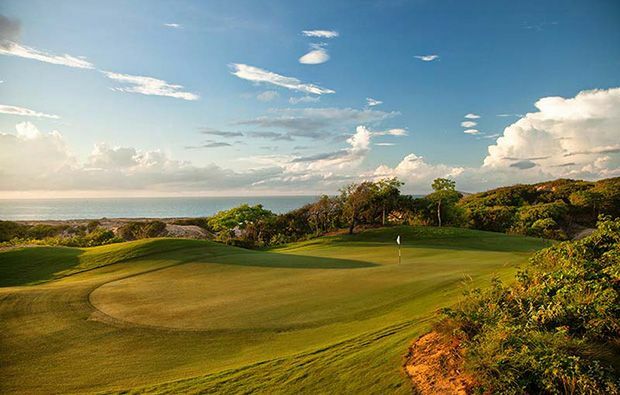 You then have back-to-back par 5’s – the first of which is playable as long as you keep right off the tee and can negotiate the slope in front of the green. The 6th offer the big hitters the chance to gte up in two but a huge bunker stands guard to catch the mishit approach. The par-4 8th is the only hole which has water in play off the tee and the 9th has a wide open fairway so an opportunity to give it everything with your driver. The back nine on the Bluffs Ho Tram Strip begins with a monster par-5 with a blind second shot and a green sitting between a waste area and a bunker. 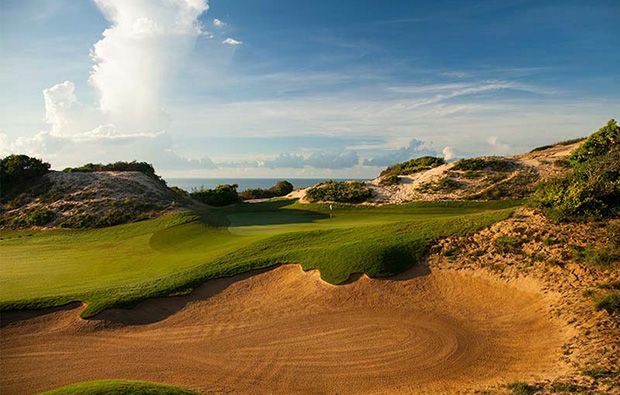 Then it’s onto the 11th – one of the most beautiful holes on the course set against the blue ocean with a well-protected green which is actually larger than it looks off the tee. The 12th is a driveable downhill par-4 and the next hole is a true “risk and reward” hole which will tempt you to reach form your driver but a huge sand dune lies in wait for the wayward shot. The 14th is probably the easiest par-4 on the course but the 15th which is the longest par-3 on the course is a totally different proposition with a waster area running from tee to green. 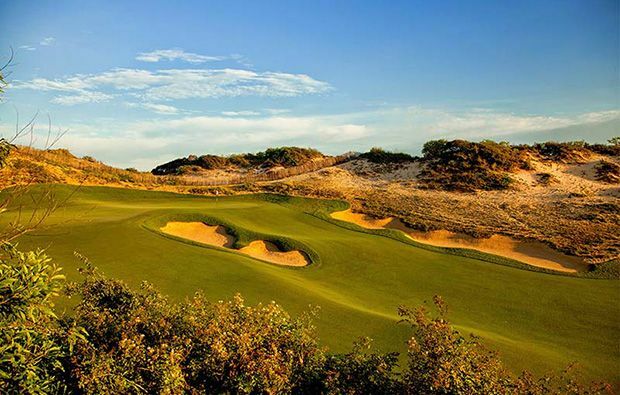 Tow relatively straightforward holes follows which both offer scoring chances before your reach the finishing hole which is the longest par-4 on the course and uphill all the way. A multi-storey clubhouse with great views over the course with huge restaurant and modern locker rooms. 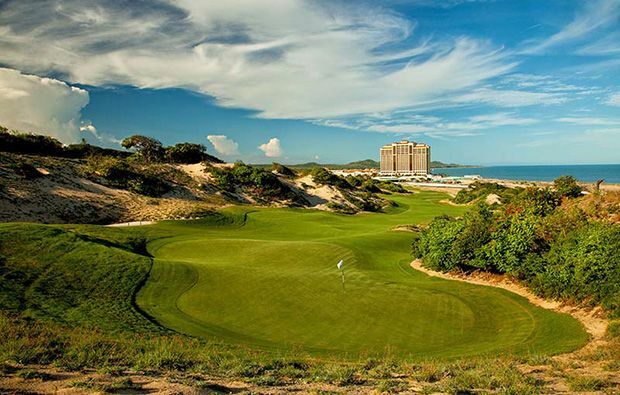 You should definitely include the Bluffs Ho Tram Strip as part of any Vietnam golf holiday and we have excellent tee times here and at all the golf courses in Vietnam. The Bluffs Ho Tram has different Services to offer. Choose a date and number or players to see the rates.